Church clothing for women is an integral part of our company. Our women church suits, dresses for church and church hats are highly selective, exclusivechurch apparel designer brands. Notably, these women church outfits are fashionable, and deliver a tremendous value in an online shopping experience that a lot of fun to visit and quite easy to navigate. 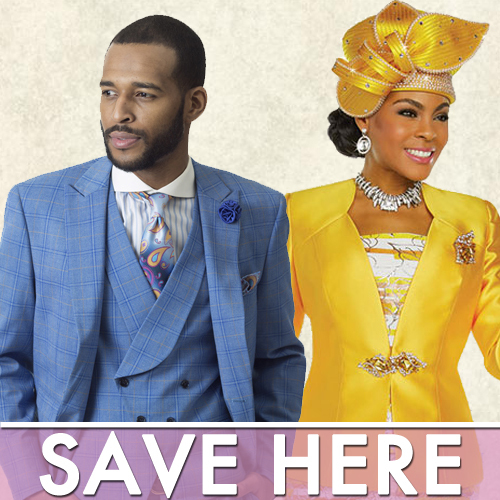 We hope you enjoy our church clothing shopping experience. After all, for over 30 years, we've helped millions of women who dress for church look as great as they feel. And, please do not hesitate to share any of your personal, inspirational stories as you celebrate each Sunday dressing for church. Be Blessed!